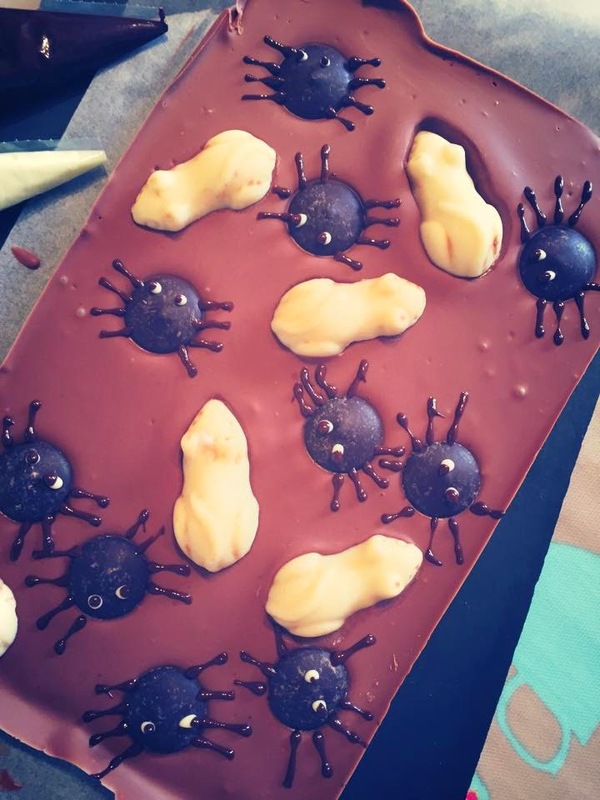 As you all know I've been developing lots of Halloween recipes over the last few weeks. I loved throwing my boys halloween parties when they were little. Pin the rib on the skeleton, blindfold bumps, apple bobbing and of course a ghoulish feast. 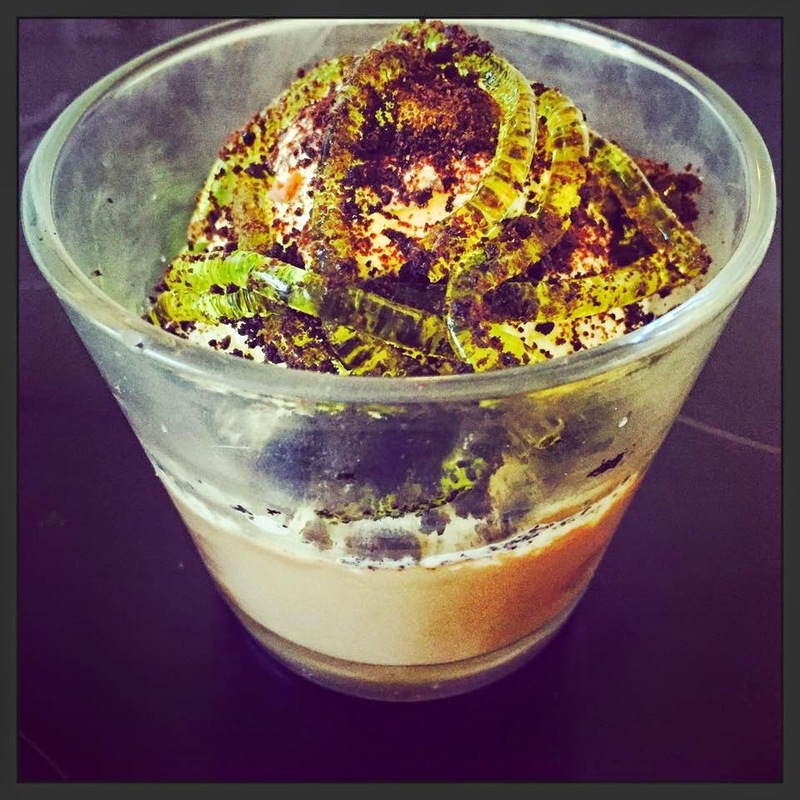 I really hope you enjoy recreating these recipes that I've developed as much as I enjoyed developing them. If you are looking for a super simple halloween treat idea? 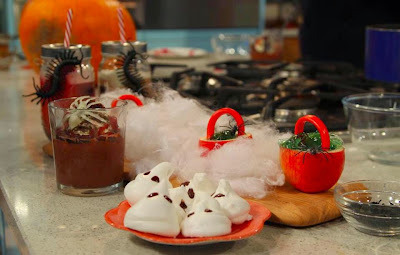 Look no further, here are my very cute pumpkin shaped meringue lollipops. Whip the egg whites in a very clean bowl to soft peak stage, keeping the whisk running start adding the sugar a tbsp at a time (don't try rushing) carry on whisking until when you place a little of the meringue between your thumb and forefinger it doesn't feel gritty. Spoon the orange meringue into a piping bag fitted with a star nozzle and the green into a disposable piping bag. Now using the circles for an outline pipe the orange meringue to make 5 pumpkin shapes, pop on the sticks (I used paper straws) and pipe over the top of the bottom meringue (so you basically have a double layer with the straw in the middle. 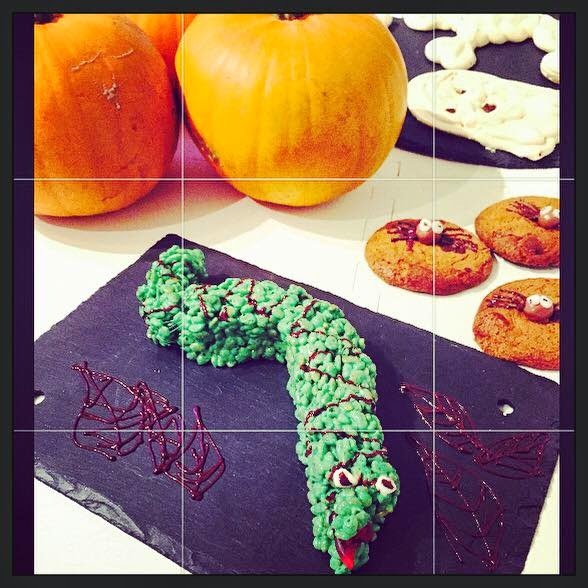 To use the green meringue, simply snip of the tiny tip of the piping bag and pipe some swirly leaves onto the top of the pumpkins, then create stalks with the liquorice and pop into the leaves. 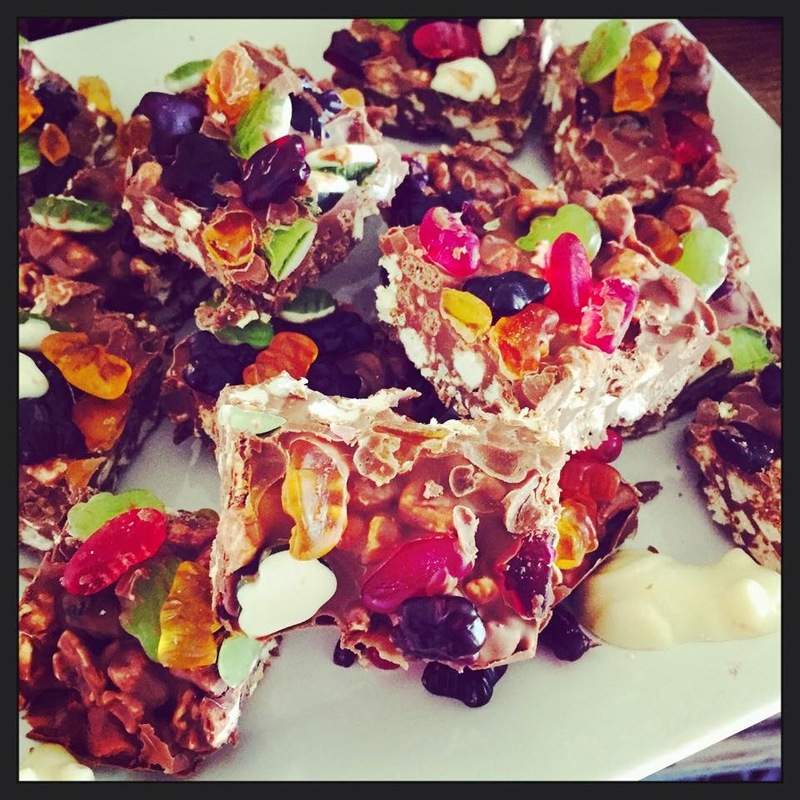 Bake in a preheated oven* for about 1 & 1/2 hrs or until the lollies peel away from the parchment easily. This will fill one Bundt tin. 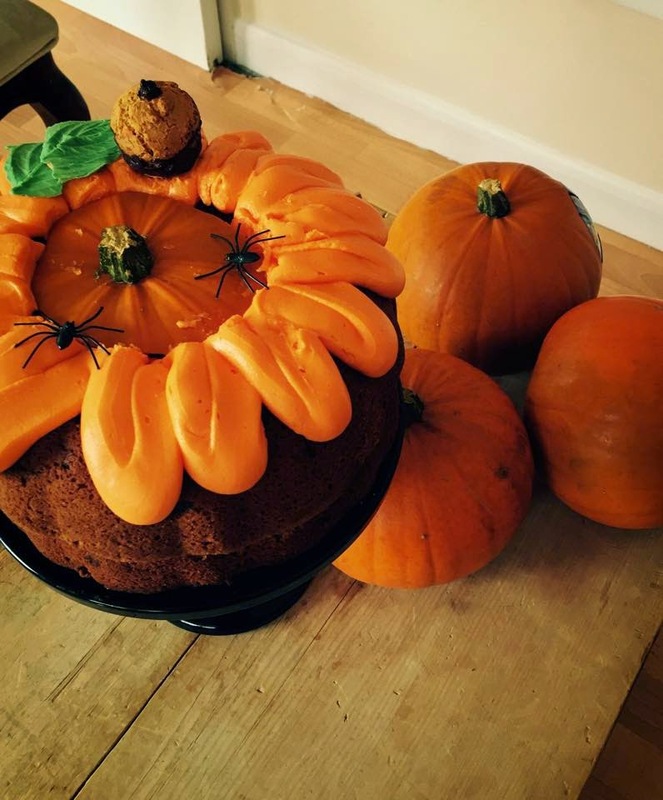 If you'd like to create the pumpkin shape just double the mixture and bake two. Then sandwich together using the frosting (when both cakes are cold). You will also need a bundt tin, greased with cake-release spray, plus a piping bag. Mix together 1 tbsp of the lemon juice with the cream to thicken it. Add to the bowl along with the grated pumpkin and coconut. Fold in the flour, spice and baking powder carefully. Pour the mix into the prepared tin. Bake in the preheated oven on the middle shelf for 55-70 minutes or until golden and a skewer inserted into the cake comes out clean. If you notice the cake is colouring too quickly, cover with foil. Remove from the oven and leave to cool in the tin for 10 minutes and then carefully transfer onto a wire rack to cool completely. Meanwhile, whip your butter for 5 minutes until soft and creamy add the icing sugar whip for a further 3 minutes, now add the food colour and cream cheese whip until combined, don't over whip at this stage as the cream cheese will split. Spoon into a piping bag and pipe swirls over the top of the cold cake. Pour the milk chocolate into a bowl and place over a pan of water, heat over a medium heat until it reaches 42ºC or until it just starts to melt, remove from the heat and set to one side stirring until completely melted. When it feels cool to the touch pour into a lined 10x7 baking pan. Leave to set slightly before adding dark or white chocolate buttons. Melt the dark and white chocolates in disposable piping bags popped into a cup of boiling water. 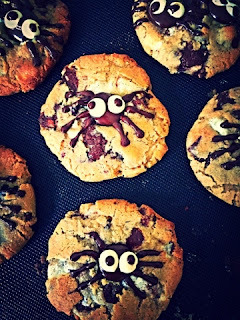 When the chocolates have melted remove from the cup of water and leave to cool and firm slightly for a couple of minutes before snipping the ends from the bags and piping the spiders legs and eyes. Now in the gaps add some chocolate mice. and look how Harley has grown!!! Slice the tops from 6 apples, now scoop out the centres using a dessert spoon leaving about a third of the apple flesh, and being careful not to scoop out to low or the apples will leak. Next brush the insides with a little lemon juice. 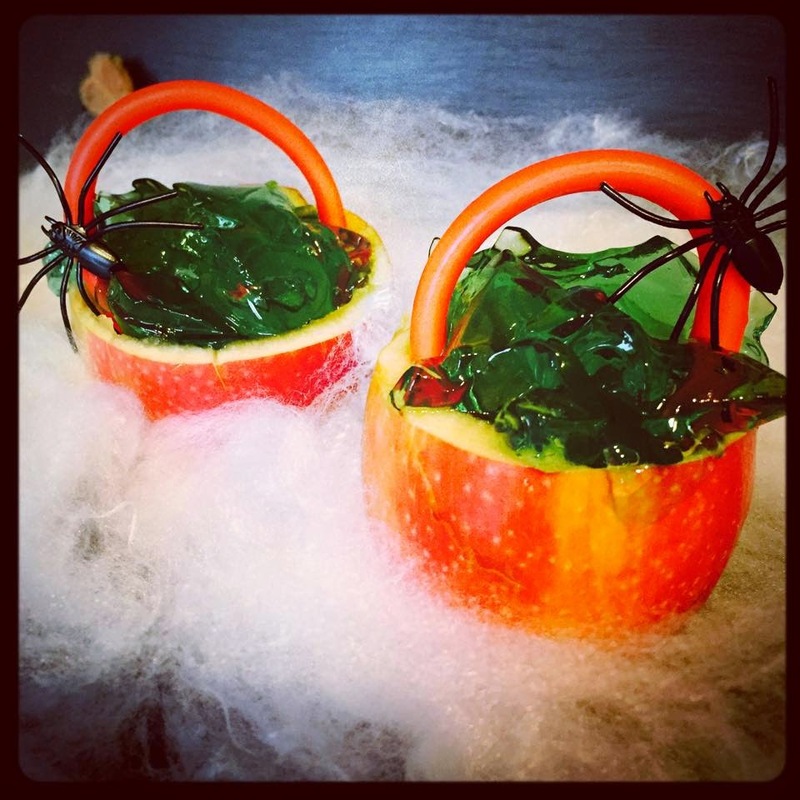 Mash the jelly slightly and divide equally between the apple cauldrons, fashion a handles from the sweet strawberry pens and add a spider. Gently heat the chocolate until melted, either in 20 second bursts in the micro or over a pan of warm water, once melted stir in the golden syrup set to one side to cool a little. Now tip the Weetos, popcorn, mini marshmallows and 50g of the jelly sweets into a large bowl, pour over two thirds of the melted chocolate, and stir until everything is well covered, spoon into a lined 10x10 tin. Add the oil to the remaining chocolate, stir then pour over the rocky rd and leave for about 5 minutes to settle until tumbling the remaining jellies over the top. Pop into the fridge until complete set. Cut into small squares to serve. Place a scoop of sorbet into each glass, now add the frozen fruits, mix together the lemonade and apple juice and pour into the glasses and serve. Whisk the egg whites in a clean bowl until they reach a soft peak stage, now turn down the machine and slowly add the caster sugar, turn up the machine and whisk until firm and glossy. 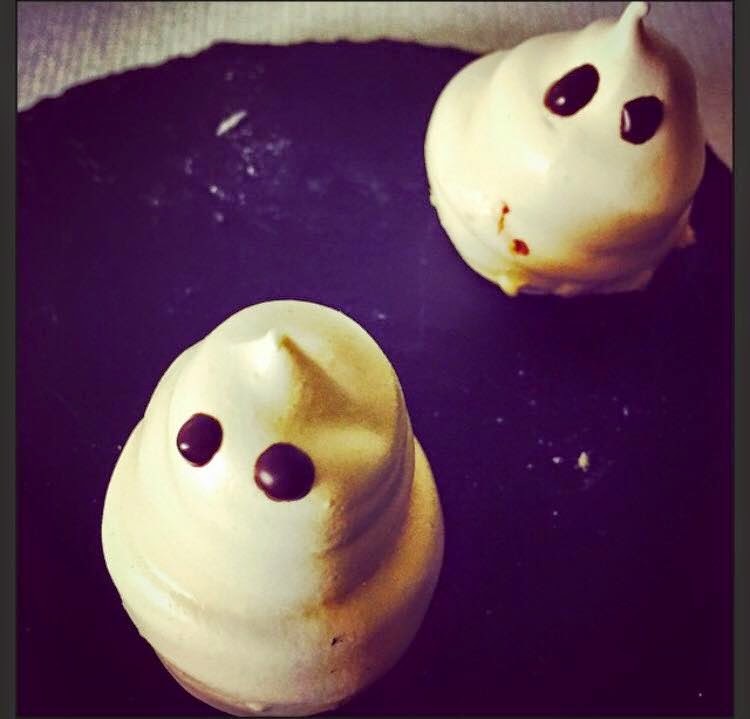 Spoon into a disposable piping bag, snip off the end and pipe cone shaped meringues onto a parchment lined baking tray, bake in a very low oven for 90 minutes, this will give you beautifully white ghosts. Leave to cool completely before melting a little dark chocolate and piping on the details. 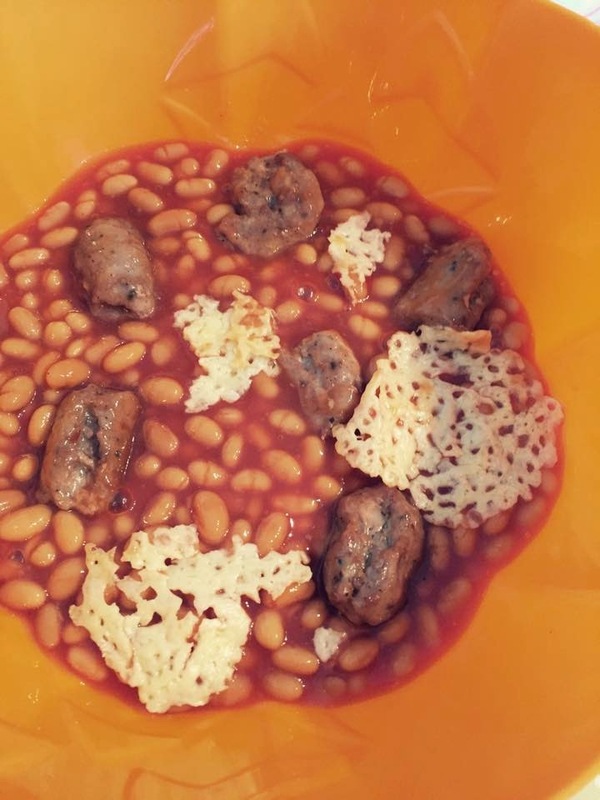 Start by skinning the sausages and dividing into 3 pieces, pop into a baking tray, place into a preheated oven and cook for about 12-16 mins, you want them to be cooked through but without much colour. Now make 6 little mounds of grated cheese on 2 lined baking sheets and cook in the hot oven for about 3-5 mins until they become lacy, pop to one side to cool completely. Heat up the baked beans, and spoon into a serving dish, add the sausage brains and the second before serving place on the cheesy pus. Serve either with thickly sliced toasted bread or on jacket potatoes. Place the pancetta onto a lined good quality baking tray, place another sheet of parchment over the top of the bacon, and cover this with a second good quality baking sheet,place into a preheated oven and cook for about 8-10 mins. Meanwhile to make the broomsticks tops, pull the stings apart to about a third down the cheese strip. Remove the pancetta from the oven, and take away the top baking sheet and top piece of parchment, while the pancetta is still warm wrap it around the un-shredded ends of the cheese strips. Push a twiglett into the base to make the handles. These can be served immediately or will keep for a couple of hours. In a freestanding mixer or by hand mix together all the pizza base ingredients until you have a soft dough. Divide into 6 pieces. Sprinkle a piece of parchment with a little polenta and shape your dough into the shape of a witches hats, cover with a smear of tomato puree, then sprinkle with a pinch of dried herbs and cover with the grated cheese. 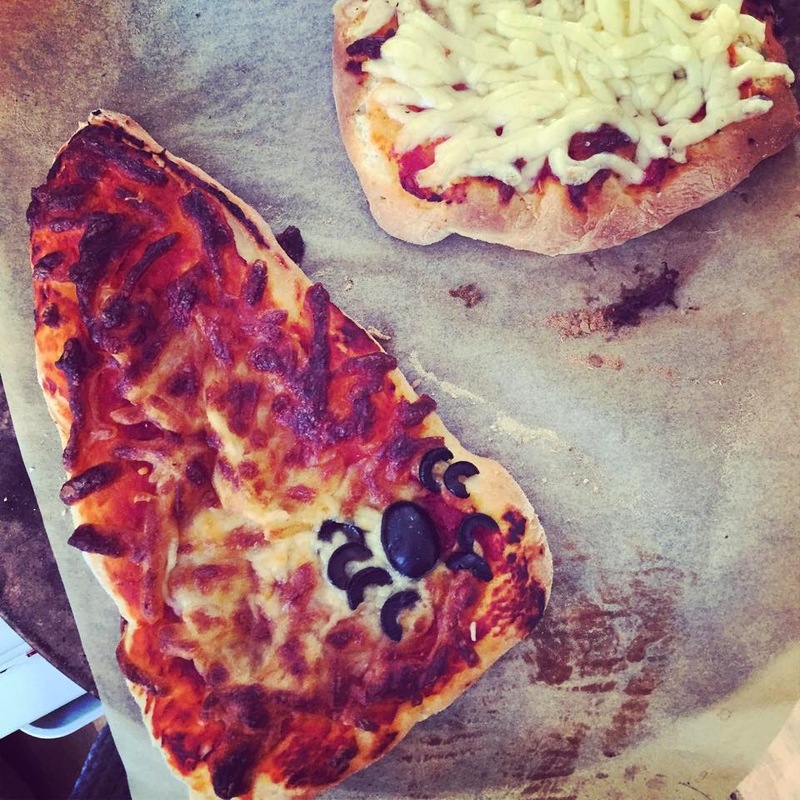 Cut the olives in half length ways making half into a spiders bodies and then 2 halves into 8 to make the legs. Place onto the hot baking trays and bake for 8-12 mins depending on the thickness of the pizza base. Melt the marshmallows in the micro in 20 second bursts, mix in the butter and food colour, stir in the rice krispes, leave to cool for a couple of minutes. To shape the snake I sprayed my hands with some 1 cal butter spray but you could use a little oil or a little melted butter, its just to stop you becoming a sticky mess, once your hands are nicely greased shape the Krispes in to a snake shape. 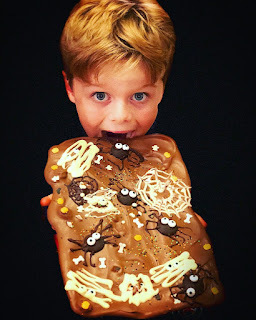 Place on to a board and melt a little chocolate, pipe some detail onto the snake, then slice a mouth for him and pop in the red sweet for a tongue. The day before you want to make this, make up the jelly with the half a pint of boiling water, this is half of the normal stated amount but this is correct. 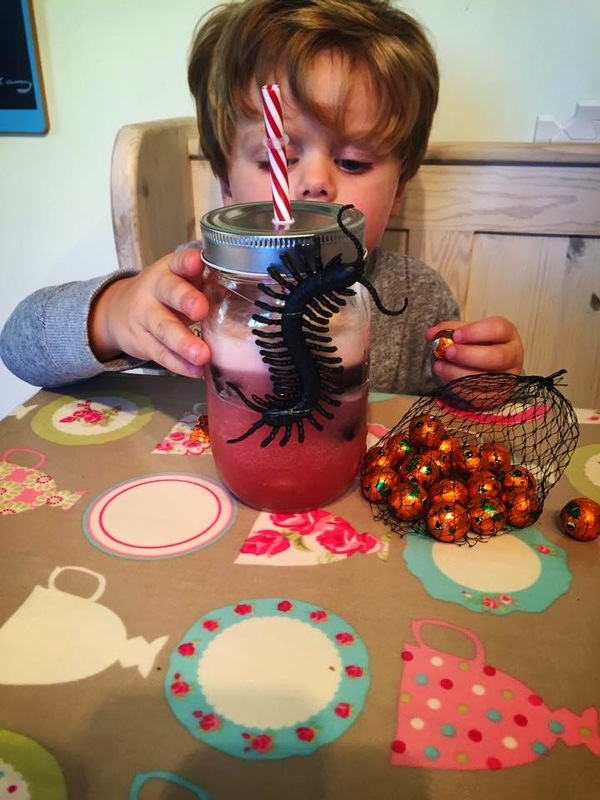 Pull the bendy bit of the straws so they are fully extended, and now cram them into a pint glass and wrap an elastic band around the middle to keep them standing upright , pour the jelly into them and pop into the fridge to set overnight. Now bring 350ml of the cream to the boil, leave to cool for 10 minutes or the chocolate will split, add the chocolate to the cream and stir until well combined and glossy. Chop the matchmakers into small pieces and stir into the chocolate, divide into 6 small glasses. Pop into the fridge for at least 4 hours or overnight to chill. To serve, whip the remaining cream to soft peaks, and spoon into a piping bag, pipe a large blob onto the chocolate, pop the Oreo’s into a food processor and pulse until you have a sandy consistency. Spoon a sixth over each dessert, to release the jelly worms, pinch the end of the straws and squeeze the worm out straight onto the desserts. 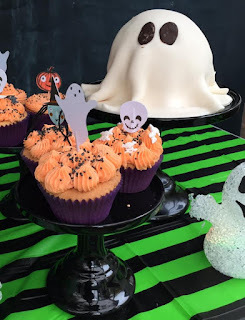 For my ghost cake bake any sponge mixture you like in a 2 pint pudding basin, then cover with buttercream, roll out a circle of white fondant and cover the butter-creamed cake pipe chocolate eye detail onto parchment, when it sets place in the eye position.